I’m a huge Joe Kissell fan. I’ve read many of his books, and have always come away with important information and time saving tips. 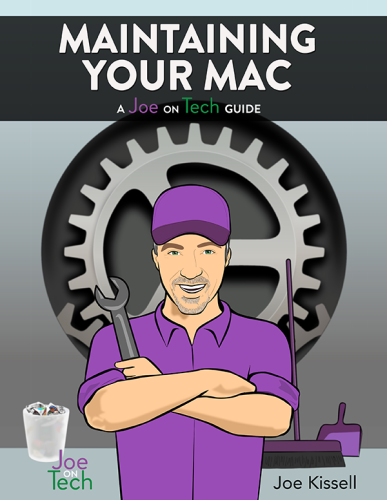 Maintaining Your Mac is another such book, with a qualification. This book is divided into nine chapters, including performing daily, weekly, monthly, and yearly tasks; getting started; and maintenance tasks to skip. This isn’t a book about troubleshooting; rather Maintaining Your Mac emphasizes preventing problems before they begin. As is Kissell’s style, Maintaining Your Mac is well organized, and is written at a level anyone will understand. It makes more sense to read it in order, bookmarking sections of importance or interest for future reference. “Cruft” is a term we hear a lot when referring to junk and useless files that have accumulated on our computers. Knowing what truly is cruft and how to safely remove it can be challenging. Kissell discusses what he considers cruft and how to get rid of it, both manually and with maintenance utilities. Of particular interest to me were the sections on clearing caches and deleting cookies since I’ve read conflicting advice on these topics. Kissell’s suggestions made a lot of sense, and it will be his advice that I’ll be following from now on. The bonuses at the end of the book are quite handy. A printable checklist that includes important daily, weekly, monthly, and yearly tasks can be posted near your computer as an easy way to remember what needs to be done and when. In addition, Maintaining Your Mac includes a link to Kissell’s web site where readers can download a Cheat Sheet, used for teaching the book to others, or to accompany the printable checklist. I mentioned a qualification: if you are an experienced Mac user, most of this book reiterates what you already know. Backing up, emptying trash, and checking for software updates are common occurrences for many Mac users. That said, it doesn’t hurt to have a reminder to keep us on task. If you’ve never read a book written by Joe Kissell I strongly suggest you do, and Maintaining Your Mac is a good start. It will be well worth your time and money. MyMac.com Review Rating: 8 out of 10 for novice Mac users, 7 out of 10 for experienced Mac users.